It Worked for Me is filled with vivid experiences and lessons learned that have shaped the legendary career of the four-star general and former Secretary of State Colin Powell. At its heart are Powell’s “Thirteen Rules”—notes he gathered over the years and that now form the basis of his leadership presentations. Powell’s short but sweet rules such as “Get mad, then get over it” and “Share credit” illustrate his emphasis on conviction, hard work, and, above all, respect for others. A natural storyteller, Powell offers warm and engaging parables on succeeding in the workplace and beyond. Taken together, they comprise a powerful portrait of a reflective, self-effacing leader. 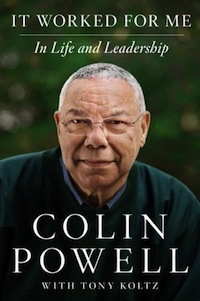 Thoughtful and revealing, Colin Powell’s It Worked for Me is a brilliant and original blueprint for leadership.